I continue with cataloging the collection of the Chaldean Cathedral of Mardin. In a very important manuscript, some other texts of which I hope to publish in the near future, I’ve come across a short work counting the years from Adam up to the mid-fifteenth century. I’ve just uploaded a document with both the Syriac text and an English translation here, and below just the translation is given. The text comes from an East Syriac manuscript dated to 1770 AG (= 1458/9 CE), Chaldean Cathedral of Mardin (CCM) 20, ff. 235r-235v (olim Diyarbakır 106). Judging from the text itself, it is original to this manuscript (i.e. it’s not a copy). In its details for the years, I have not compared it with other similar texts in Syriac or other languages, but I offer it with an English translation simply as an example of how a fifteenth-century Syriac scribe looked back very briefly across human history as he saw it. 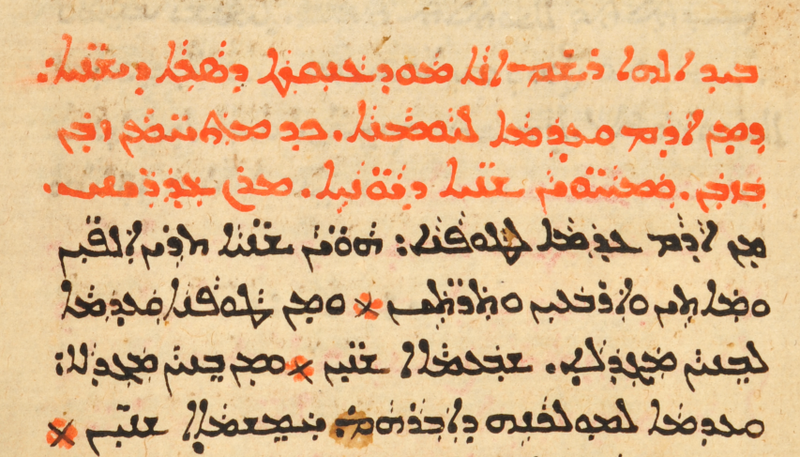 In addition, Syriac students might find it to be a short and easy text, especially to practice their knowledge of Syriac numbers. With God’s help I note down an index of the sum of years from Adam to today, [the years] sometimes defined, indicating the years of the Greeks. Our Lord, help me! 1 From Adam to the Flood there are 2242 years. 2 From the Flood to the building of the Tower [of Babel], 700 years. 3 From the building of the Tower to the promise [made to] Abraham, 500 years. 4 From the promise [made to] Abraham to the exodus from Egypt, 430 years. 5 [From that time to the time] of Moses, Joshua b. Nun, 67 years. 6 [From that time to the time] the kings, 524 years. 7 [From that time to the time] of the Babylon[ian captivity], 70 years. 8 From the freedom from Babylon to the crucifixion of our savior, 480 years. 9 From the crucifixion of our savior until the Persians ruled, 81 years. 10 From [the time] that the Persians ruled [f. 235v] until the Arabs [ṭayyāyē] ruled, 505 years. 11 From [the time] that the Arabs ruled to the year in which this book was noted down, 862 years. 12 The sum of all the years is 6950 years. 13 The years that the Persians ruled are 550 years. 14 The blessed lady Mary received the good news [i.e. the Annunciation] in the year 303 of the Greeks. 15 Our savior was born in the year 304. 16 He was baptized by John in the year 334. 17 He suffered, died, arose, and ascended to heaven in the year 337 of the Greeks. 18 From the ascension of our Lord to the year in which this book noted down, 1433 years. Ended is the reckoning and numbering of the years from Adam to the year in which we are.